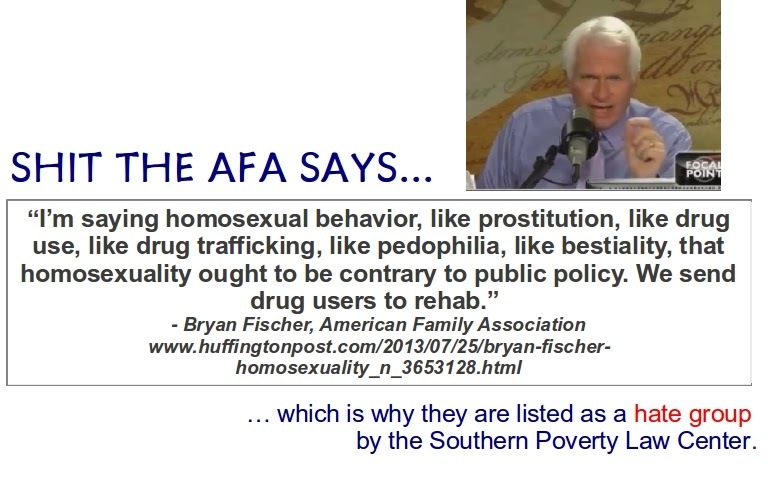 As an openly gay man living in the reddest of the Red States, I can be forgiven for spending an unhealthy amount of time thinking about Bryan Fischer and the American Family Association. Headquartered not far from where I work in Tupelo, an omnipresent voice all over the radio, with a daily tsunami of Facebook posts and tweets, Bryan Fischer and the AFA, like magnolia trees and dry counties and Duck Dynasty, are inescapable facts of life in the state of Mississippi. When I moved here three years ago, I could not fathom how it was legal for Bryan Fischer to go on public airwaves and say, on an almost daily basis, the most disparaging and woefully ignorant things about gay people. Comparing them to Nazis, suggesting they were responsible for the Holocaust, calling them a danger to public health, a threat to religious liberty, a threat to the economic well being of the United States, routinely classifying them with pedophiles, deeming homosexuality a “sexual sickness” and just as dangerous as addiction to hard drugs, talking about how we can either have religious liberty or homosexuality, but not both – day after day, the tide of myth,misinformation and just plain foolishness was hard to stomach. 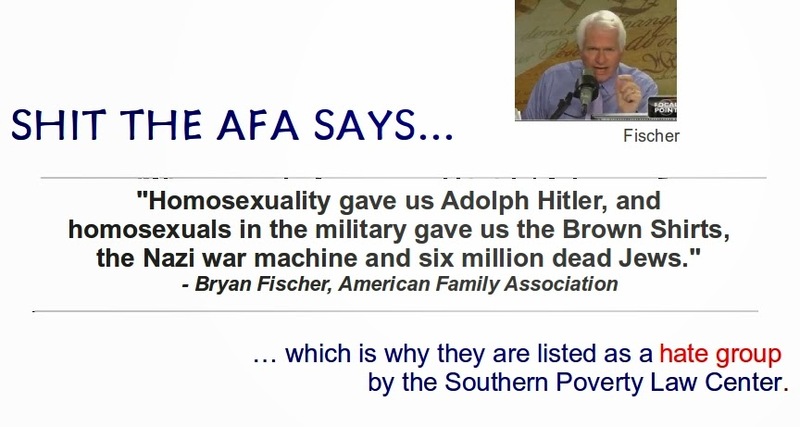 But harder to stomach was the apathy of Mississippians who shrug and sigh and seem to believe there is nothing to be done even though Bryan Fischer and the AFA have earned themselves a hate group designation from the Southern Poverty Law Center. Protected by the right to free speech and freedom of religion, wrapping their myth and misinformation in religious garb and calling American Family Radio programs like Bryan Fischer’s FOCAL POINT a “ministry,” they are a monolithic entity safely removed from the consequences of their actions. I have watched in disbelief as most local media outlets, when they report on gay rights (rather rare, to be sure), go microphone in hand to the AFA for a comment—as if there were no other religious or spiritual leaders in north Mississippi they could talk to. I find it incredibly offensive that anyone would care what a hate group would have to say about a complex issue like gay marriage. Even more offensive is the media’s failure to seek out other voices on such issues, as if the AFA alone had some sort of monopoly on the gay rights conversation. But then the AFA has been having a one-sided conversation on gay rights since it was founded back in 1977. When I inquire as to why no one will speak out against the AFA, I am frequently told that one does not mess with them. It’s as if they were some sort of mafia organization, as if one might wake up one day with concrete boots while being tossed into a swamp for having the audacity to have one’s own point of view. When I started a Facebook page (Stuff the American Family Association Says) designed to document the hate speech coming out of the AFA, I was warned to be careful. Why, I wanted to know. Just be careful, I was told. Really? Am I supposed to be afraid of an organization that calls itself Christian? Are they going to break the law, or do something unchristian to me? Yet I’ve noticed how silent politicians and elected officials are with regard to the AFA. I’ve also noticed that local media outlets don’t mention the fact that the AFA was designated a hate group by the Southern Poverty Law Center, as if ignoring that fact of life might make it go away. Or are they afraid of offending and losing advertisers? My Facebook page has not exactly been a rousing success. As of this writing, only about one hundred and fifty souls have been brave enough to click “like” on my page. Some people have sent private messages stating they cannot “like” my page for fear that people on their friends’ lists will find out. Are we back in grade school? Are we not allowed to have our own opinions? Last year, a small group of hardy souls organized a protest march in front of the AFA headquarters in downtown Tupelo. We were about two dozen, in all. We were largely ignored by the media – as if a protest against the AFA right on their own front door was somehow not news, or not newsworthy. While the AFA believes itself protected by free speech and freedom of religion, so are the rest of us. We have just as much of a right to engage in this conversation as they do. As a gay man, in fact, I would argue that I have more of a right to speak my mind than they do. This is an issue that affects me directly. This is an issue I have struggled with for decades. I listen to American Family Radio frequently, but I have never once heard them talk to a gay man about the issue of homosexuality. What are they afraid of? No doubt they have enjoyed their one-sided conversation on this issue. But isn’t it time to hear the other side? Isn’t it time for gay Mississippians – and there are many of them – to speak up, to speak out, to tell their stories, to tell the truth about what it means to be gay or lesbian or transgender? Might we not be allowed to hear from other spiritual and religious leaders? Is there no room in Mississippi for alternative points of view? Bryan Fischer hides behind his microphone and religion. I wonder how comfortable he would feel if challenged to a public debate on the issue of homosexuality. Since the man talks about homosexuality almost every single day, surely he would relish the opportunity to demolish an articulate gay rights advocate like John Shore or Dan Savage. Fischer and the AFA are, in my opinion, cowardly bullies who hide behind religion and radio dials and Facebook posts and tweets. They are interested only in a one-sided conversation. They do not seem to realize they are talking about real people, a great many of whom live next door to them, in their own communities, people who attend their churches, who rub elbows with them at the grocery store. They seem oblivious to the harm caused by their hate speech and demonization of others. I will continue my no doubt woefully inadequate efforts to document their hate speech and provide an alternative point of view and I will do so because it’s important for young members of the LGBT community to realize that Bryan Fischer does not speak for everyone in this state. I am not afraid of the AFA; neither should you be. We have the right to decide our own religious beliefs. We have the right to free speech and we are entitled to our own opinions. We do not live under a fascist dictatorship where the AFA talks and the rest of us do nothing but listen. Our fathers and forefathers did not fight for our freedoms so that organizations like the American Family Association could run roughshod over the rights of fellow citizens. They fought, and many times died, to preserve our right to hold our own religious beliefs and to speak our minds on issues that matter to us. I do not believe the AFA speaks for everyone in the state of Mississippi. They may be a powerful organization and there may be good reasons to fear their retaliation. And they may well run the table on the gay rights conversation in the magnolia state. But they are not the only ones with a point of view. It is way past time for Mississippians to shake off the dust of apathy and indifference in the face of this massive and daily assault on the rights and dignity of fellow Mississippians. Gay people are not child-molesting, goat-buggering, disease-ridden threats to religious life and limb. We are sons and daughters, brothers and sisters, created by the same God and entitled to the same rights and dignities as everyone else in this great country. It’s high time we acted like it. The AFA is one-sided on everything and bashing gays is its new religion. They are not interested dialog or conversation. Their entire message is to present anyone who disagrees as some kind of demon. I cannot listen to them often because they vex my spirit, and because they're idiots. So how do we take then down? Are there ANY religious organizations willing to support us? Any local or state politicians? I'm not afraid of them either. I'm willing to fight for our rights. Why is there a Stand With Phil Robertson banner on your blog? Google puts ads on my blog. I've seen some strange ones from time to time too. Can you suggest some specific steps we can take? I would have gladly protested with you but I live in sw Mississippi. BTW today your banner is for a traditional marriage group.